I met Megan and Warren last September at Lauren’s (Megan sister) wedding. 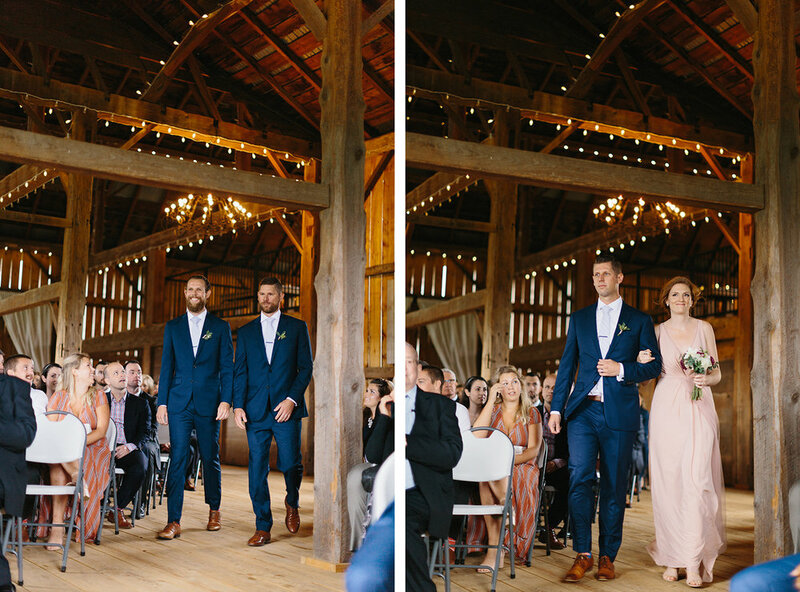 Lauren and her now husband, Richard (who actually just celebrated their one year anniversary) threw a two day wedding bash starting in Price Edward County on a Vineyard and then finishing at Mildred’s Temple Kitchen in Toronto. There was a lot of love that weekend, and A LOT of dancing. Lauren, Richard and Megan are all trained dancers so you can image the quality of the dancing was way above average. But Warren definitely held his own with some killer dance moves, fitting right in with his (almost) in-laws. Fast-forward a couple of months and I got an exciting email from Megan letting me know that Warren had proposed and that they were planning a barn wedding at an old family friend’s barn up in Bradford. I was looking forward to this wedding all year, to see familiar faces, experience the genuine kindness that these people had shown me a year earlier, and of course witness some insane dance moves. Megan and Warren’s day started off with Megan putting the final touches on her wedding cake. Megan and her mom have a side-hustle of baking and decorating wedding cakes so it was a no brainer that they would be the ones making the cake for her wedding. Of course the morning wouldn’t be completely without sharing a toast with some sparkling rosé, which had become a theme over the two weddings. 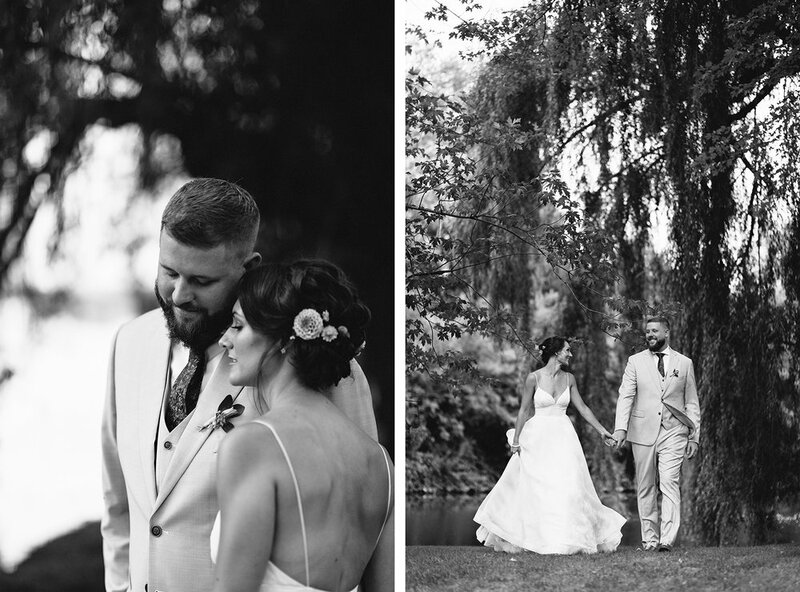 Their first look took place at Warren’s family farm in Newmarket under a gorgeous willow tree. This farm had it all, from lush cornfields to a pond that created a perfect reflection of the trees above. Not to mention it was the farm Warren grew up on, working out in the fields for the majority of his childhood. With all the love and excitement culminating after their first look, they were greeted by cheers and tears from their family. The wedding ceremony took place at a barn in Bradford. This barn happened to be owned by some old family friends of Warren’s family and they were ecstatic to share their space on his wedding day. They had recently redone the interior and exterior of the barn and had it set up to be the perfect wedding venue. From the reclaimed wood walls to the ample string lights overhead it was a romantic and rustic dream. I could go on and on about this day but I will try to sum it up for you. Being in a room with so many people who are generous, kind, and know how to have a good time, creates an energy that you can feel in the air. The buzz from this energy gave the whole event a sort of surreal feeling, and I spent the evening trying to capture that feeling in photographs. Whether it was the heartfelt sentiments that were spoken during the speeches or the hilarious group photos with the bride and groom at sunset, there was always something exciting happening and worth capturing. Megan and Warren, you are two very special people and this was, without a doubt, a day to remember.